The winning logo for KMST’s 40th anniversary was designed by Trisha Mistler of Jefferson City, Mo. Public radio station KMST will celebrate its 40th anniversary on Saturday, Aug. 24, on the campus of Missouri University of Science and Technology. Join the KMST staff for this free event as they journey back in the station’s history. The evening of fun and music will begin at 7 p.m. in Leach Theatre of Castleman Hall, 10th and Main streets, in Rolla. 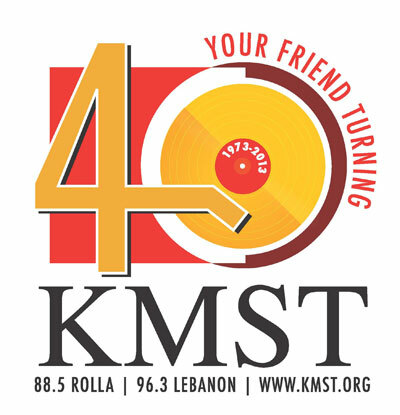 The event’s theme, “KMST — An Old Friend Turning 40,” celebrates the station’s 40 years as a public radio station. Entertainment will include a memorabilia film, family friendly comedy by improvisational group Stop Making Sense, as well as live music by Dixie Union, the Little Piney Hellbenders, the Missouri S&T Jazz Band and more. Attendees will also have the opportunity to raise funds for KMST tower repairs by bidding on items in a silent auction or by purchasing a professionally produced “KMST 40th Anniversary Commemorative Video” or a 40th anniversary T-shirt designed by Trisha Mistler of Jefferson City, Mo. Admission to the event is free, but tickets are required. Tickets are available from the following Rolla locations: Phelps County Bank, Kroger, Public House Brewing Co., Country Mart, Kent Jewelry, Leach Theatre Box Office and KMST. In Lebanon, Mo., tickets are available at Dickey’s Barbeque Pit and Mid-Missouri Bank. Tickets will also be available at the door as supplies last. Major sponsors for the event include Brewer Science, Phelps County Regional Medical Center and Phelps County Bank. In its 40th year of service, KMST is a 100,000-watt non-commercial public radio station licensed to the Curators of the University of Missouri System. The station’s funding comes from the Corporation for Public Broadcasting, Missouri S&T, membership investments and underwriting. KMST offers a mixed format of news from NPR, nationally and locally produced talk shows, and a wide range of music, including classical, jazz, acoustic folk, blues, big band, Celtic, bluegrass and Caribbean. KMST is located at 88.5 FM in Rolla and surrounding communities, 96.3 FM in Lebanon, Mo., and is live streamed online. Listeners can also follow the station on Facebook. It sounds like a great celebration and 40 years of radio is something to be really proud of. I enjoy listening to the classic jazz on KMST.